The osc. 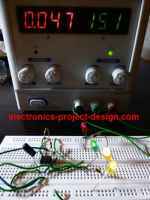 is a graph displaying device that display the electrical signal based on the input to its probes. It shows in real time how signals change over time. Usually the Y axis represents the voltage and the X axis time. a) Shows and calculate the frequency and amplitude of an oscillating signal. b) Shows the voltage and time of a particular signal. This function is the main used of all the functions described here. c) Helps to troubleshoot any malfunction components of a project by looking at the expected output after a particular component. d) Shows the content of the AC voltage or DC voltage in a signal. When there is a change in the height of the waveform, it means that the voltage has changed. If the line is horizontal it means that there is no change in voltage for that period of time. Some of the common waveform that are measured using an osc. are as shown below. There are basically 2 types of osc. namely analog or digital type. Analog uses continuously variable voltages. Digital uses discrete binary numbers that represent voltage samples. Analog osc. works by directly applying a voltage being measured to an electron beam moving across the osc. screen. The voltage deflects the beam up and down proportionally, tracing the waveform on the screen. Digital osc. samples the waveform and uses an analog to digital converter to convert the voltage measured into digital format. It then uses this digital format to display the waveform. It enables one to capture and view events that may happen only once. They can process the digital waveform data or send the data to a computer for processing. Also, they can store the digital waveform data for later viewing and printing. In choosing to buy an osc., the designer needs to understand the terms used and what they are. By understanding the terms, one will be able to compare the features offered and its price. The bandwidth tells the frequency range the osc. can accurately measures. When the frequency of the measured signal increases, the ability of the osc. to accurately respond decreases. The gain accuracy shows how accurately the vertical system attenuates or amplifies a signal. This is shown in percentage error. The time base or horizontal accuracy indicates how accurately the horizontal system displays the timing of a signal. This is shown in percentage error. Rise time is another way of describing the useful frequency range of an oscilloscope. Rise time need to be considered in the measuring of pulses and steps. It cannot accurately display pulses with rise times faster than the specified rise time of the osc. The vertical sensitivity indicates how much the vertical amplifier can amplify a weak signal. Vertical sensitivity is usually given in millivolts (mV) per division. The smallest voltage a general purpose osc. can detect is typically about 2 mV per vertical screen division. This specification indicates how fast the trace can sweep across the screen. It is usually shown in nanosec per div. In digital type, the sampling rate shows how many samples per second the ADC can acquire. Maximum sample rates are usually given in megasamples per second (MS/s). The faster the oscilloscope can sample, the more accurately it can represent the fine details of a signal. The minimum sample rate may also be important if you need to look at slowly changing signals over long periods of time. Typically, the sample rate changes with changes made to the sec/div control to maintain a constant number of waveform points in the waveform record. The record length of a digital osc. show the number of waveform points the oscilloscope is able to acquire per record. The maximum record length depends on its memory. There is a trade off in acquiring either a detailed picture of a signal for a short period of time or a less detailed picture for a longer period of time.